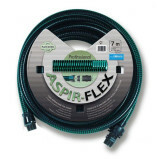 The DAB NOVA 300 M-A including hose (7m) can be ordered from us for € 149. You can then start immediately. The DAB Nova 300 M-A Submersible Pump is highly suitable for supplying water directly from a reservoir or tank. You can get started instantly with the hose included in the kit. It allows you to pump water easily from the source, which is handy for the water supply to your greenhouse or vegetable garden. 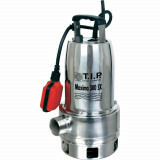 Thanks to the pump's higher capacity, it is more convenient than other – smaller − submersible pumps. This model is suitable for processing clean and cloudy water, with a maximum passage of solids up to 10 mm. Extremely handy to use in and around the house. 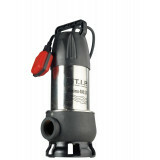 Draining flooded basements or rooms/cellars, for example, can be done perfectly with these pumps. 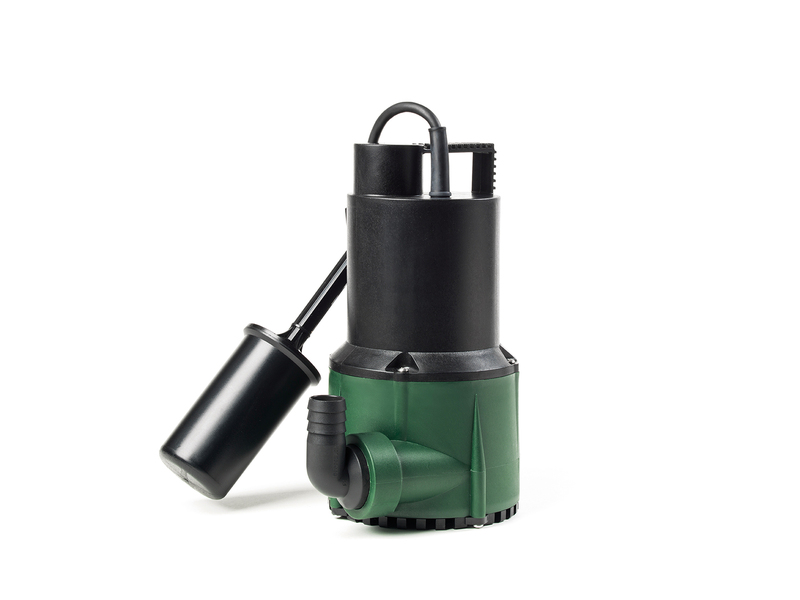 In addition, owing to their ease of use, these submersible pumps can also be put to work in acute situations involving flooding, or for draining water from swimming pools, fountains, or reservoirs. This pump is fitted with a float switch, which means that it switches on/off automatically based on the water level. In manual mode (fastening/raising the float), this pump drains water to a level of 5 cm. 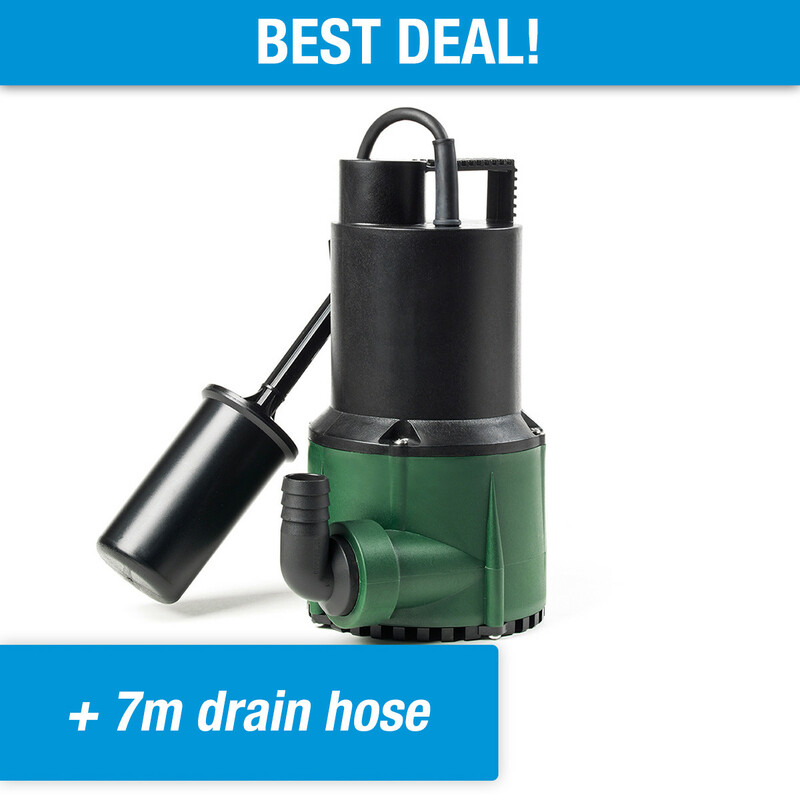 If you are looking for a pump that leaves less water/switches on automatically sooner, you can opt for a submersible puddle pump. We offer a set for many of our pumps. This way, we want to help you get started as quickly and efficiently as possible. If you're looking for a replacement pump for an existing system, you can always order the pump separately. We offer that at a lower price (below the set). The set is composed of accessories to get the most out of your product. We also try to extend the lifespan of your pump with these accessories, letting you enjoy your purchase as long as possible. DAB is one of the most popular water pump brands for consumers as well as professionals. These pumps use very high quality standards. Before a pump is put on sale, each unit is tested manually by an employee. This is DAB's way of ensuring you get the highest possible quality. DAB has a solution for practically every situation. Whether it's an industrial application or just irrigating your garden. 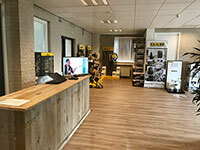 DAB's professional quality is also evident in their range of consumer products. The DAB pumps we replace for people are often over ten years old. This submersible pump has a float switch. 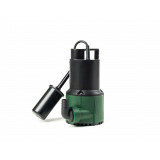 This float switch ensures the submersible pump switches on and off automatically. Each pump has its own variables when it comes to when it will switch on or off. Heavy-duty dirty water pumps often have a high level for starting and stopping. They will switch on relatively late and switch off relatively late. Unlike submersible utility pumps, which start sooner and stop later. Check the pump specifications for these variables. There are three types of float switches A free-floating float switch attached to a cable, a lever float switch, and an internal float switch. The free-floating float switch needs room, as it can move in all directions. The lever float switch needs less space, as it only moves up and down. This makes it more reliable in general. Finally, there is the internal float switch. It has been built into the pump and requires the least amount of space. These internal float switches are often used on submersible utility pumps that have to operate in small spaces. Not sure about the quality of our product? We offer a 5-year warranty on this pump, no extra conditions, forms, or registrations. We guarantee high quality. This is how we have selected our product range. Better than many other brands, and we want to share this with you. We don't just offer the most important accessories to increase the lifespan of your pump, we now also give you a long warranty period. This means a lot less worry for you. You don't have to do anything. The 5-year warranty is included when you purchase this pump. Material Pump body, impeller, head piece, and suction grid made of technopolymer. Motor, rotor shaft, and screws made of stainless steel. Triple sealing in oil bath. Max. temperature of liquid from 0°C to 35°C for domestic use – a temperature of 45°C for short-term use. Is this model too weak or too strong? Choose another model from the same series below. Very satisfied about my purchase. Fast delivery and easy to use. Highly recommended! Great pump and extremely fast delivery. Very satisfied. They could've included a slightly smaller connection piece, though. My current connection piece has a slightly slimmer hose. Other than that, a great pump and no wet feet anymore! My old submersible pump - same brand, same type - was starting to fail me after several years. Therefore the slightly lower rating on quality. Nevertheless, I ordered the same pump because it has the same dimensions. Very satisfied about delivery. Hopefully this new pump will serve me longer. Had to replace my previous pump with the same model. Not the cheapest option, but works very well thanks to the float switch. Pump works great, good advice and speedy delivery. Bought a similar DAB for draining domestic wastewater twelve years ago. After years of reliable operation, the pump completely gave up the ghost. Didn't need to think twice about a replacement. I have the DAB Nova 300, which I want to use to drain water from my washing machine. Is the pump suited for this?? Dear toulousemarie, thank you for your question. The DAB Nova 300 M-A is definitely suited for draining water from a washing machine! Used for protection against flooding after cloudbursts, which is happening quite frequently now. Performs well! Meets my demands. I use it for my dormers. Pumps automatically with high water levels. Great that it has a float switch! This pump was delivered after I’d been given advice by telephone. Fast delivery, easy to operate, and drains my space quickly. I have used this pump for two weeks for the reservoir in my vegetable garden. I drain the reservoir so that I can water my garden. Handy and easy storage when it’s not being used.